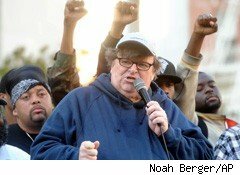 Love him or hate him, one thing you've got to give to Michael Moore: He's never at a loss for words. Problem is, some of the things he's been saying lately don't make a lot of sense. Take last week for instance. Appearing on CNBC for an interview Monday, America's most famous corporate gadfly took up the banner of the Occupy Wall Street movement, and declaimed against corporate greed, bailouts for bankers, unemployment ... you get the picture. "Round up the usual suspects." So far, so good. I actually agree with a lot of these complaints, and had been complaining about them way back before OWS was even cool. But after several minutes of reciting his usual corporate malfeasance spiel, Moore turned to the surreal. "I don't own a single share of stock, and I have never owned a single share of stock. I don't support this. [Pointing at NYSE] This is a rigged casino. I don't know why anybody would put their hard-earned money into this, especially after what happened in this last decade. ... Who's making this money? Who's dividing this pie up so that the 1% get the majority of it?" Now, everyone's entitled to their opinions. And Moore is not even entirely wrong on his facts. Depending on which report you cite, the "top 1%" of American earners do indeed own, if not a majority of the nation's wealth, then at least a plump plurality --roughly 33%. And if you scoot down the income scale just a tad, you will indeed find the majority of the nation's wealth residing in the wallets of the "top 10%." But that's just the point. Of course the people who have all the loot already are going to reap the most gains from investing said loot. What doesn't make sense, though, is why Moore refuses to invest alongside them. What makes no sense is Moore's argument that because wealthy Americans are investing in the stock market and making money from it, you should stay out of the market. That's like saying: "My neighbor Bob the accountant earns $100,000 a year at his job, but I only make $50,000 working in the mail room at the same company. So I'm going to quit my job and go on welfare because I'm not making as much as Bob is." Sure, maybe Bob is an overpaid hack -- but that doesn't change the fact that I am still collecting a paycheck. It's no reason for me to turn down the money I can make. A few years back, I crunched some numbers and came to the conclusion that, based on historical data, anyone investing $50,000 in a simple S&P 500 mutual fund can expect to grow this money into about $200,000 over the course of about 15 years. Now sure, that's not a huge profit compared to what Jerold T. Megabucks IV would earn by investing $50 million in the same fund. But it's still $200,000 more than nothing. It's also more than the alternative. If instead of investing in the stock market, you heed Moore's advice and put your $50,000 in a savings account, say, maybe at a credit union, and earn 1% a year interest on that, what do you wind up with? About $58,048 at the end of 15 years. And that's the real upshot of Moore's advice for America's 99%: Rich folks invest in the stock market. Poor folks don't -- so if you're poor, you should remain so. Of course, this ignores the fact that one key path to becoming rich is by ... investing in the stock market and reaping its average 10.5% annual gains. Now, are there crooks on Wall Street? Indubitably. If you swing a dead cat up there, chances are pretty good you'll clock a banker or CEO who, as Moore put it: "played with people's futures, played with people's pension funds, with these derivatives and credit default swaps." But just because you can hit 'em, doesn't mean you have to invest in 'em. I'll prove it to you. Over at The Motley Fool, we've started a new project dubbed "Rising Stars." Eighteen of our analysts compete to see who can pick the best investments and make the most money on the stock market. Since day one, the best of our portfolios belongs to my Foolish colleague Alyce Lomax, who's outperformed the S&P 500 by a factor of four. She did it not by investing in derivatives and credit default swaps, though. She didn't sell her soul to Goldman Sachs (GS) or patronize Wall Street at all. Instead, Alyce took the high road, and purposefully assembled a portfolio of "socially responsible" companies with "strong corporate governance," including Costco (COST), Starbucks (SBUX), and Google (GOOG). And companies like these have helped her earn a 16.1% return since the project began. Not bad for one small Fool, competing with millionaires and billionaires in "a rigged casino." I'd stack it up against the 1% interest Moore earns by owning "not a single share of stock" any day of the week. Fool contributor Rich Smith owns shares of Google. The Motley Fool has a disclosure policy. The Motley Fool owns shares of Costco Wholesale and Google. Motley Fool newsletter services have recommended buying shares of Starbucks, Google, and Costco Wholesale.